From the reengaging of relations with Cuba, to a deal with Iran, over the last month President Barack Obama's actions in several areas have been substantial in their historic relevance. He has moved the country into dialogue with parts of the globe that have long been disconnected from the U.S. But as a former prosecutor, and one of the producers of the documentary on the lasting effects of mass incarceration and the cocaine epidemic that aired earlier this year on Al Jazeera "Freeway: Crack in the System", no part of his recent platform has been more awe inspiring than his actions on the issues of criminal justice. For the first African American president to speak on changing a criminal justice system that shows such clear signs of bias, and then follow it with a visit to a federal prison to speak to inmates is the mark of the moral arc bending toward justice. As shown in our documentary, you cannot appreciate the meaning of President Obama's actions without looking at the hard line position taken on incarceration by U.S. presidents over the last 30 years. From the unfair crack sentencing laws under President Ronald Reagan, followed by the effects of President George Bush's push to eradicate drug use, bleeding into President Bill Clinton's Violent Crime Control and Law Enforcement Act. Which President Clinton has now admitted made the problem worse. 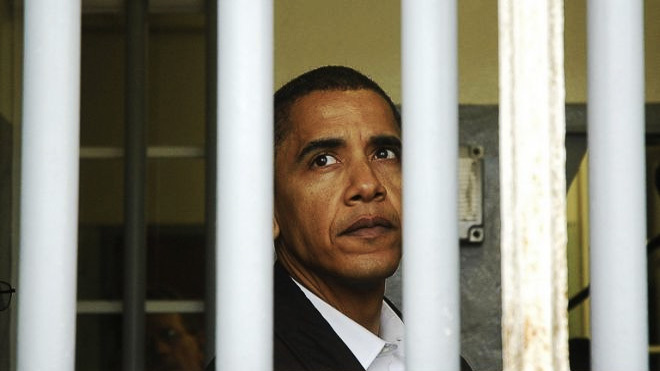 When President Obama stood in the middle of Cell Block B in El Reno Federal Correctional Institution speaking to prisoners, and recognized that he also could have been an incarcerated black male statistic, he forced America to open its eyes and see the true dichotomy of the black male existence in our country today. One where while we have a commander in chief that is a black male, African American males make up almost half of all prisoners, despite only being slightly over 6% of the population. As I stated prior in the piece on the Huffington Post "The Black Male Incarceration Problem is Catastrophic", “there are more African American men incarcerated in the U.S. than the total prison populations in India, Argentina, Canada, Lebanon, Japan, Germany, Finland, Israel and England combined.” To give background there are only about 19 million American black males in total, the above nine countries together represent well over 1.5 billion people. This is the context for the President’s historic visit to a federal prison in Oklahoma. While to this point he has only made statements about potential policy, ranging from reviewing solitary confinement, to moving away from mandatory minimums. The hope is for a set of executive orders, and a possible push for a bill to follow. Yet, the reality is that in these times for the first black president to mention the remarks referenced above in and of itself is a monumental moment. He took his actions further with the speech he made to the NAACP only days earlier, where he all but condemned the current structure of our criminal justice system. To now see the president moving the ball forward in such a direct way on criminal justice in the last leg of his presidency is inspiring a nation to also look closer at the issue of mass incarceration. It gives us all hope that we are finally on the verge of a change we can believe in. Antonio Moore is a former prosecutor in Los Angeles. He is also one of the producers of the documentary on the Iran Contra, Crack Cocaine Epidemic and the resulting issues of Mass Incarceration "Freeway: Crack in the System presented by Al Jazeera" The film was shown at The Regent Theater in Downtown Los Angeles on July 24th 2015 at 5pm as part of the Downtown Film Festival. Mr. Moore has contributed pieces to theGrio, Eurweb and Huffington Post on the topics of race, mass incarceration, and economics.